Save by pairing your airfares and lodgings. Expedia has some amazing Mahale Mountains National Park holiday packages that'll save time and give you more money to spend! Would you like to earn savings up to 15%*? Buy your family's package deal on Expedia now! With more than 400 partner airlines and 321,000 properties worldwide for you to pick from on our global database, you'll have your dream holiday in no time! Almost all bookings can be cancelled without any additional fees from us. We have all the latest sightseeing tips for your upcoming trip to Mahale Mountains National Park. Grab your organizer and prepare to start filling up your itinerary. Are you ready to head outside and have a little fun? The Tanzania region offers some fabulous activities for you to try, such as rock climbing. Still got time to spare? Mountain climbing is a second activity to throw on your travel itinerary. 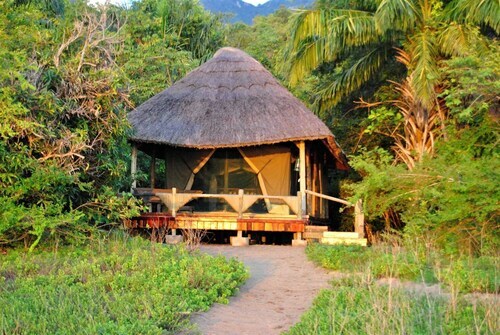 Nearly ready for your trip to Mahale Mountains National Park? Wondering where you'll be landing? Bujumbura International Airport (BJM) is the nearest terminal. Once you've hit the ground and wandered out of the gate, you'll be 210 miles (338 km) from all the action. This lodge is situated on a lake.